Dr. Matthew J. Teramura is a second generation Japanese American born and raised here in the Bay Area. Dr. Teramura grew up in Union City, California. He graduated from James Logan high school in 1992. He transferred from Chabot community college to the University of California, Irvine in 1995. There he earned his Bachelor of Arts degree in Applied Ecology from the School of Social Ecology in 1998. He then attended the prestigious Boston University School of Dental Medicine were he earned his Doctor of Dental Medicine Degree in 2003. After that he stayed an additional year to attend the well known and respected post graduate residency program called Advanced Education in General Dentistry at Boston University. Here he fine tuned his skills and knowledge and upon completion of his residency in 2004 he received his Certificate of Advanced Graduate Study in General Dentistry. During his residency Dr. Teramura passed the California Dental Boards and was able to move back home to the Bay Area were he has been practicing dentistry last 10 years. 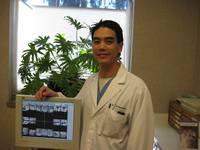 Dr. Matthew Teramura is a member in good standing with the American Dental Association (ADA), California Dental Association (CDA), and the Souther Alameda County Dental Society (SACDS). He has taken hundreds of hours of continuing education to stay current and up to date with the latest technology and advances in dentistry today. Dr. Teramura practices general family dentistry and does very well with children. Areas of special interest and training include Oral Surgery: removal of impacted 3rd molars, Implant Dentistry, Molar Endodontics, Pediatrics, Esthetics and Invisalign. Dr. Teramura is a Invisalign Certified Provider.